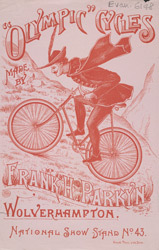 Cycling was popular during the 19th century, and a large number of contemporary leaflets and adverts survive for a great variety of different designs and models. The safety bicycle, pictured here, was the first bicycle to have wheels of equal size and its pedals operated from the back wheel by means of a chain drive. It 1888 the basic model was improved by the addition of rubber tyres invented by Dunlop, which made riding much more comfortable.